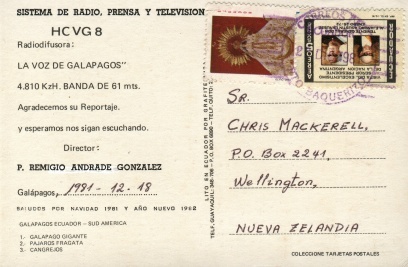 Great interest was created amongst New Zealand DXers when news broke in the August 1976 DX Times that La Voz de Galapagos was being heard on shortwave. The youngest province of the Republic of Ecuador lies 500 miles off the Ecuadorian coast, in the Pacific Ocean. This is the Galapagos Islands, an archipelago of 12 large and several hundred smaller islands, with a total area of about 5000 miles. The largest town, San Cristobal, is the home of The Voice of Galapagos, a 5000 watt broadcaster with the call-sign HCVG8, which provided good reception in NZ on the 60 metre band frequency 4810kHz when signing on around 1210 hours GMT. At this time signals were often very good, and programming was audible to after 1545z. From time to time, reception has been noted at 0400 (sometimes later) when the station signs-off for the day. 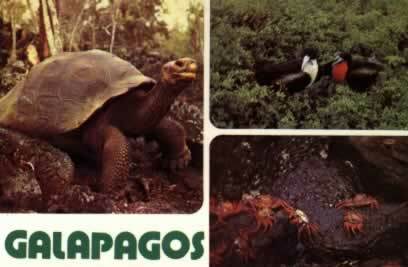 The Voice of Galapagos is run by the Franciscan Mission and station director was Reverende Padre Edgar Raül Pinte. Transmission times were officially 1215 to 1450 hrs GMT and 2300 to 0400 GMT but, as indicated above, these hours were often extended a little. The Islands have their own time zone GMT – 6, separate from the rest of Ecuador. At sign-on, around 1215 GMT, full station identification in Spanish was given and the station slogan ‘Mensaje de Dios, Patria y Cultura’ (Message of God, Country & Culture) was featured several times. The distinctive sound of seagulls introduced the day’s transmissions. A brief religious service followed, and then mainly light orchestral music was featured, with regular identifications and time checks. Barry Williams received a verification letter in Spanish, signed by the Director and also Sister Isaura Arbelaez N., Secretaria, who was responsible for station correspondence. Arthur Cushen had previously verified the station, when on it’s former frequency of 6255kHz. 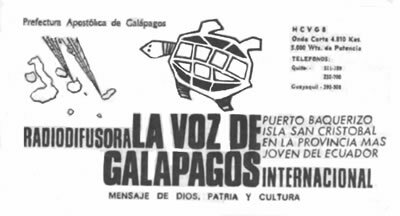 According to The Voice of Galapagos they have a medium wave affiliate station Radio Santa Cruz on 1410kHz. Santa Cruz is one of the islands in the group.